Where: Knott Creek Falls, 2583 Fiedler Road, Harper, Texas 78631. Meals and refreshments will be provided. What to Bring: Your form DS2019, casual and cool clothes, toiletries, swim suit, water shoes, sun screen, towel, and spending money. Inbound students –this is a mandatory orientation, so please make arrangements with your host families to bring you there. Please reply by September 4, 2018 to let us know if you will be there. It will be an amazing weekend, and we cannot wait to see all of you there! District 5840 Youth Exchange Inbound students gathered Sept. 9 through 11 in New Braunfels for Inbound Orientation, along with exchange students being hosted by four other Texas districts. In addition to learning what's expected of them during their year in Texas, the students had a chance to go tubing on the Comal River, visit the shops in Gruene and hang out as they got acquainted. 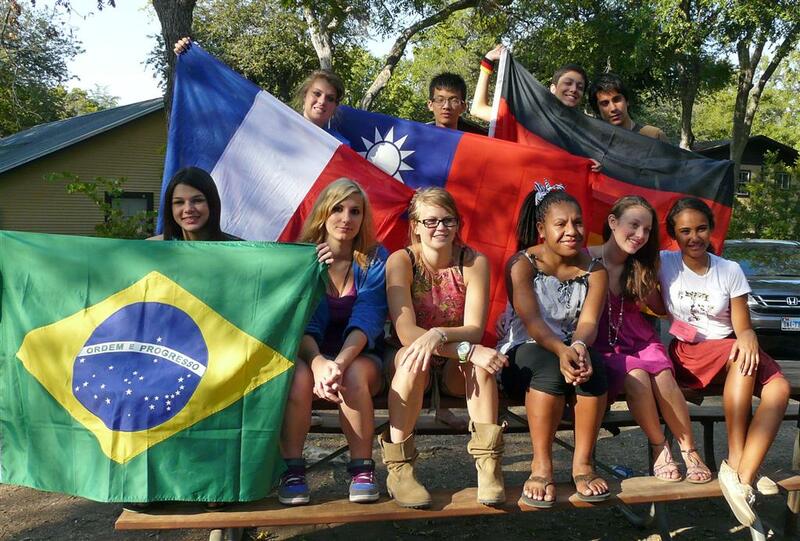 The late Past District Governor Floyd Harriman established the Youth Exchange Program in our district in 1969. The Rotary Club of Pleasanton exchanged a student, Floyd's daughter, Patty, with Denmark. That year, the Pleasanton Club hosted a student, Alette Kolstrop, and the Alamo Heights Club hosted a student, Bente Ingvarson, also from Denmark. Since those first three students, our district has sponsored more than 1,200 inbound and outbound students. At the Rotary International Convention in Minneapolis, Minnesota, in 1974, the Convention recognized the program as an integral part of Rotary International and since that time has endorsed the program wholeheartedly. The program is a means of advancing international understanding and goodwill. The program each year now involves more than 8,000 students from 82 countries, making it one of Rotary's largest, most popular and most successful programs. The Youth Exchange Program involves more dollars being spent than any other program in Rotary International except for PolioPlus. Recent RI studies estimate that more than $42 million annually is spent on the Youth Exchange Program by parents, clubs and districts, with very little funding flowing through RI. During 2012-2013, our district is sponsoring 16 outbound students to 11 foreign countries, and is hosting 14 inbound students from nine countries. The program is open to young men and women ages 15 to 181/2, who may be children or grandchildren of Rotarians or non-Rotarians. The students' parents, local Rotary clubs, and the district finance the program. Selection is based on a written application as well as personal interviews at the club and district levels with the applicant and the applicant's parents. A long-term exchange for an academic year, during which the student lives with more than one host family and attends school in the host country. A short-term summer exchange, for three to four weeks. It does not include an academic program. Link to South Central Rotary Youth Exchange (SCRYE) at scrye.org. SCRYE is an organization of 36 Rotary districts in 15 states that helps promote and facilitate Rotary Youth Exchange through training and resources to help member districts manage their exchange programs. Inbound Students: learn more about your insurance coverage at CISI-Bolduc.com. See "Quick Tips on CISI-Bolduc Insurance" in the Downloads section to the left for information about filing a claim and getting more information about your insurance coverage.